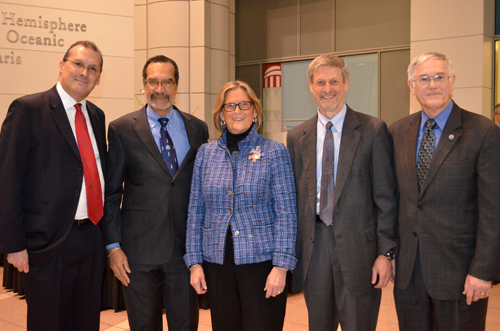 Paul DiGiacomo, Pablo Clemente-Colon, Dr. Kathleen Sullivan, Sasha Ignatov, Bill Pichel. Not pictured: Tim Schmit. Today Dr. Kathryn D. Sullivan announced this year's Gold and Silver Medal award winners. These medals, which are the highest awards bestowed by the Dept. of Commerce, recognize distinguished performance by NOAA employees. The honorees included 4 STAR scientists: Bill Pichel and Pablo Clemente-Colon were recognized for their research in synthetic aperture radar products. Tim Schmit (CoRP / ASPB) was recognized for critical support extending the useful life of aging weather satellites. And Sasha Ignatov (SOCD/SOSB) was honored with a Silver Medal for scientific excellence and leadership in developing NOAA's web-based sea surface temperature monitoring system. 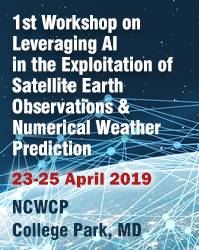 Nominated by NESDIS for research, development, and operational implementation of high-resolution coastal wind products from satellite synthetic aperture radar data. Nominated by NESDIS for outstanding critical support extending the useful life of aging geostationary weather satellites, thereby greatly improving coverage over South America. The Silver Medal � The second highest honorary award granted by the Secretary of Commerce, a Silver Medal is defined as exceptional performance characterized by noteworthy or superlative contributions which have a direct and lasting impact within the Department. Nominated by NESDIS for scientific excellence and leadership in developing and implementing NOAA's web-based, real-time, high-quality sea surface temperature monitoring system.